Service Spotlight: Five-Axis CNC Machining | KLH Industries Inc.
KLH Industries is now offering five-axis CNC machining services on a new Doosan VC630/5AX equipped with coolant through spindle and an 81 station tool changer. The Doosan VC630/5AX is a trunnion-style five-axis machine, meaning it has a 360-degree rotary table on an integrated 150-degree trunnion. For the machinists, that’s a fully rotating C-axis on a tilting A-axis. The head of the machine adds movement in the X-, Y-, and Z-axis, but the spindle remains stationary like a traditional three-axis machine. This allows for greater rigidity and torque while machining at lower RPMs. 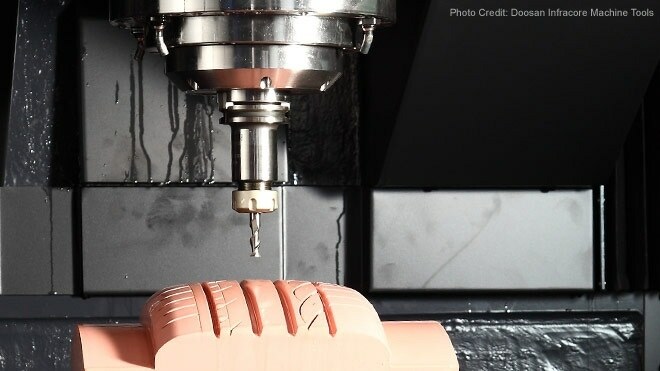 Conversely, some five-axis CNC mills incorporate one or both additional axes into the head itself. Compared to these swivel head machines, which need to compensate for the size of the head and the tool, the integrated trunnion design generally has more usable volume in the work envelope. Regardless of how the fourth and fifth axes are attained, five-axis machining has advantages over traditional three-axis machining. Most widely recognized is the ability to machine complex shapes in fewer (or even a single) setup. Five-axis machining services from KLH Industries are available immediately. Discuss your upcoming five-axis or CNC machining project by contacting us here, or submit an online RFQ here.